Here in the North East, the air has turned crisp. I wear a shawl over my bare arms as I write this—refusing to get into a long-sleeve shirt just yet. The nights are getter shorter and that sun-kissed glow is beginning to fade, too (sad face). So, it’s time to go faux. Luckily, there are a number of wonderful new safe cosmetics on the market in the form of bronzers that can help put the glow back into my face. Bronzing powders are more forgiving than gels, sprays and sticks, which is why I’ve focused on them. I like powder because you can swipe a touch on and then build from there, depending on how much color you want and where (all over your face and neck, only on the bridge of your nose and cheeks, etc.). 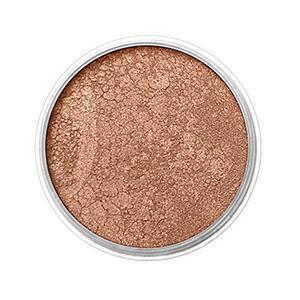 If you have super-dry skin, you may bode better with a cream-based product (try Josie Maran Argan Cream Bronzer). So, how do you apply bronzer? According to Celebrity Makeup Artist Fiona Stiles, if you wear foundation, follow up with a powder to set it and then finish off with your bronzer. 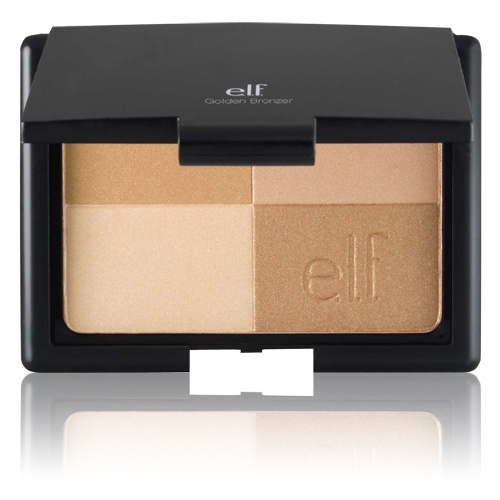 If you don’t wear foundation, try a cream bronzer, as powders can appear artificial when sitting on top of bare skin. 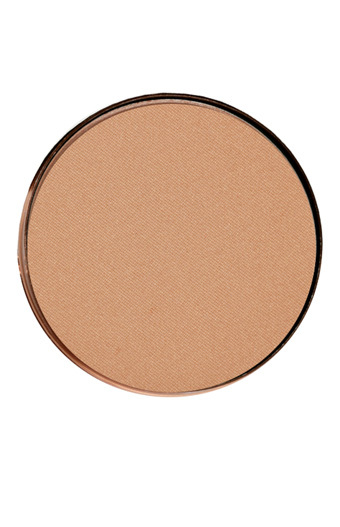 Look for a product that creates a golden glow without appearing artificial, orange-y, or even dirty. And steer clear of those with too much sparkle, since that kind of shine can be a dead giveaway that your face hasn’t seen any actual rays. Environmental Responsiveness: When creator Krissy Ferro began making her natural makeup products, she says she checked the safety of each ingredient she intended to use on Skin Deep’s Campaign for Safe Cosmetics database. Ferro’s products are, therefore, paraben-free, chemical-free and cruelty-free. Results: This bronzer is perfect for the season because it’s tinted with warm berry and gold undertones (think changing leaves). Plus, it’s pretty rich so a little goes a long way, making it super cost-efficient! It adds a healthy dash of color that leaves my skin warm and radiant with the slightest touch of shimmer that lasted throughout the daylight hours. Ingredients from packaging: Mica, Silica, Boron Nitride, Iron Oxides. Environmental responsiveness: The ZB studio reduces its carbon footprint by using 100 percent wind power and reports that it only patronizes suppliers that use sustainable harvesting practices, grow pesticide-free plants and produce Certified Organic and or natural ingredients. Some of the groups ZB studio supports include the Denali Citizens Council and Reef Check Australia. This company does not test on animals. Results: This blend of four simple ingredients is matte, so it can be worn all over without looking artificial. It slides on smooth and offers up great coverage without making my skin look sparkly, muddy or orange-y and has great staying power. Ingredients from packaging: Mica, silk powder, iron oxides, zinc oxide. Results: Because this powder is baked, its texture is silky soft to the touch and imparts a natural matte finish that feels ultra-luxurious. My skin tone looked more even and there was no shimmer so I could wear it all over instead of just spotlighting. Another plus? It's a water-resistant formula, which will come in handy once the weather turns soppy. Ingredients from packaging: Talc, Nylon-12, Hydrogen Dimethicone, Ethylene/Acrylic Acid Copolymer, Dimethicone, Polymethyl Methacrylate, Polyethylene, PTFE, Dimethiconol, Dehydroacetic Acid, Sorbic Acid, Centella Asiatica Extract, Zea Mays Germ Oil (Zea Mays (Corn) Germ Oil), Camelia Sinensis Extract (Camelia Sinensis Leaf Extract), CI 77491 (Iron Oxides), CI 77492 (Iron Oxides), CI 77499 (Iron Oxides). Environmental Responsiveness: This Peta cruelty-free company recycles 100% of cardboard boxes and packaging in its component and product deliveries. It adjusted its summer work schedule to avoid using air conditioning during peak usage hours and its Organic Wear compacts use 93% less plastic than traditional compacts. 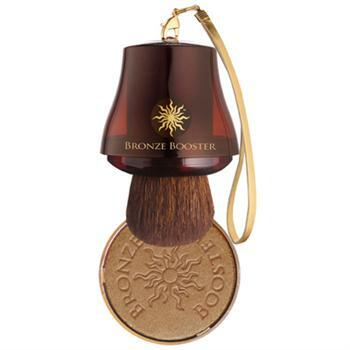 Results: I wanted to love, love, love this bronzer because it comes in a handy-dandy compact that includes a plush sliding bronzer brush and mirror with an attached strap; it’s perfectly sized for almost any bag and very cute! But, I just like it. It’s super-shimmery (as the name implies) and I suppose I’m just not a super-shimmery type girl. That being said, if I were, I would swipe the brush along my cheekbones and over the bridge of my nose for a beautiful sparkly finish. Ingredients from packaging: Synthetic Fluorphlogopite, HDI/Trimethylol Hexyllactone Crosspolymer, Cetearyl Ethylhexanoate, Glycerin, Squalane, Dicalcium Phosphate, Octyldodecyl Stearoyl Stearate, Caprylyl Glycol, Ethylhexyl Glycerin, Polysorbate 80, 1, 2 Hexanediol, PTFE, Dimethicone, Silica, Pentaerythrityl Tetra Di T Butyl Hydroxyhydrocinnamate, Chondrus Crispus, Xanthan Gum, Zinc Stearate, Lauroyl Lysine, Cimicifuga Racemosa Root Extract, Ascorbyl Palmitate, Inositol, Tocopherol, May Contain:, Iron Oxides, Mica, Titanium Dioxide. 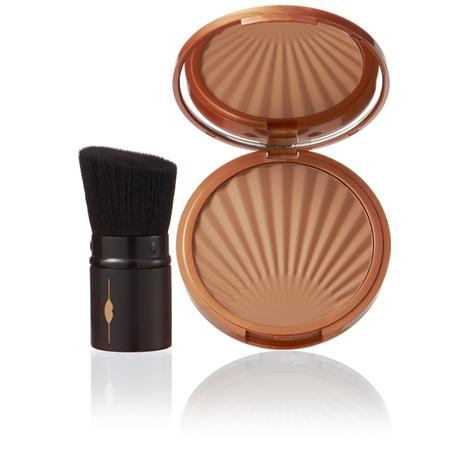 Results: This amazing bronzer goes on matte so there is no shimmer and the texture is superb, allowing for subtle application. Alternately, you can use touches to contour the bridge of your nose, your chin, and your cheekbones to create subtle shadows that focus on your strong points. Sunkissed Matte goes on lighter and it is perfect for my olive complexion during the fall and winter months when my skin is lighter. Suntan matte was a shade too dark for my current skin color, but I think it will be a perfect way to even out my skin tone once I’m tan again. Ingredients from packaging: Talc, Silica, Boron Nitrate, Zinc Stearate, Ethylhexyl Palmitate, Nylon 12, Lauroyl Lysine, Dimethicone, Methicone, Moringa Pterygosperma Seed Extract, Water (Aqua), Butylene Glycol, Caprylyl Glycol, Isopentyldiol, Phenoxyethanol, May Contain (+/-): Iron Oxides (CI 77491, CI 77492, CI 77499), Titanium Dioxide (CI 77891). Results: These sheer soft powders each offer up lovely options to highlight your face. While a touch too sparkly for over-all coverage, I do love the other options this palette offers. You can blend all four colors together or choose to mash up two or three of your faves to suit your needs. I like to highlight my brow bone with the bottom left square and to add a slight pink touch to my cheeks (top right) to warm up my face. Ingredients from packaging: Mica, Talc, Magnesium Myristate, Zinc Stearate, Titanium Dioxide, Octyldodecanol, Dimethicone, Silica, Sodium Dehydroacetate, Boron Nitrate, May Contain:, Iron Oxides ( CI 77491, CI 77492, CI 77499), D&C Red 7 Calcium (CI 15850), FD&C Blue 1 (CI 42090), Red 40 (CI 16035). How much is a First Class stamp? motilium Addressing it with a prudent manifesto and an economic plan to pay for that programme is therefore a perfectly sensible move, no matter how much Tory scorn it will receive.